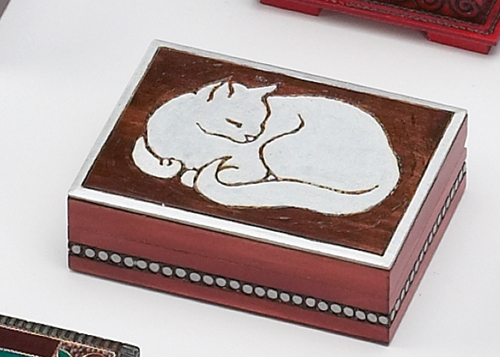 This urn is called Peaceful Cat II as it depicts a handpainted peaceful cat laying on the top of the urn surrounded by a painted border along the lid and around the sides of the box. While the cat and trimmings appear to be white in color, they are silver. This is called Peaceful Cat II as there is also a smaller size available. This larger size may accommodate the ashes of 2 cats or those of one cat and a favorite mouse or collar. Dimensions: 7-1/2 in. x 4-3/4 in. x 2-1/8 in.